This is the first time I didn't use Smartswitch in a long time. I just let Google do all the heavy lifting. And you know what? It was perfect. Down to the Zedge wallpaper. All the passwords and other settings also came along for the ride. So perfect, in fact, that I was disappointed. It looked exactly like my Note 8. I finally changed the wallpaper so that I could feel that there was some difference between the Note 9 and the older Note 8. Aside: I did send a backup of my Nova settings to myself. That's the only work I did on my own. Glad to hear it is working well! . It definitely took Google a long time to get it down like Apple. You made sure to have all the Google apps/settings, etc set to backup I'm assuming, right? Or did you use a different process? Did it also migrate your old text messages and call logs? 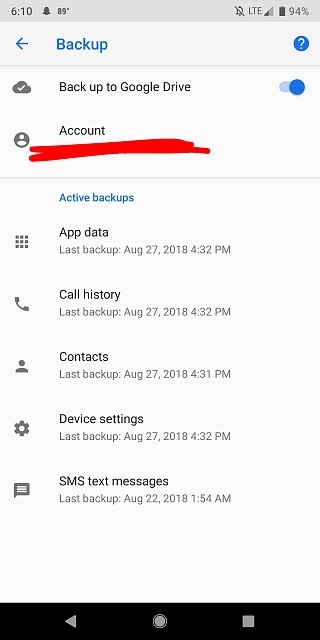 Can you explain how to set up the Google backup and then restore everything? Ah, since I use Google Voice for all calling and texting that stuff is always in the cloud. I don't know what it would do if I didn't have Voice. Yes add an account. When you log into your new phone with your Google credentials it will ask what apps you want to restore. Also, don't tell it about any wifi information, it'll just download all of that including passwords. In Nova go into backup. Select backup. Then chose "Share..." instead of device backup. Okay. That makes sense. I was using SMS backup before and manually migrating it over until smart switch came out. I actually thought smart switch messed up this time too as only a handful of texts from one person showed to in Textra. Turns out it reads the data once to update with old texts and I had opened the app during the file transfer as I got a text right in the middle of it. The messages were definitely there since it shipped up in the stock messaging app. Had to uninstall and then reinstall Textra to get it to update correctly once the transfer was complete. I want todelete the text thread but save 1 message. Is this possible? Can I position images in a Google Keep note?